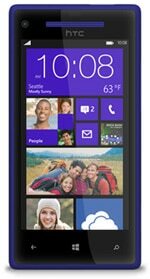 The HTC Windows Phone 8X is the Taiwanese phone maker’s first Windows 8 NFC phone. The device, which has a 4.3-inch display and uses the same internal hardware as the Android-based HTC One X, was announced on 19 September 2012 and started shipping in November. The 8X retails at around £400 SIM-free. The HTC Windows Phone 8S, announced at the same time, does not have NFC.